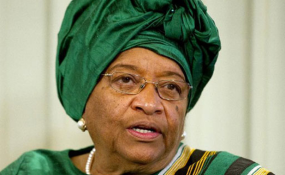 Florida, Usa — Former President Madam Ellen Johnson Sirleaf has been inducted in the International Women's Forum Hall of Fame. The IWF's Hall of Fame provides a global stage with which to honor and celebrate the leaders of nations, industry, enterprise, academia, the media, the arts and science. Comprised of more than 6,800 diverse and accomplished women from 33 nations on six continents, the IWF builds better global leadership across careers, continents and cultures by connecting the world's most extraordinary women of significant and diverse achievement. "This honor is dedicated to the women of Liberia. It is on their shoulders, through the force of their freewill, their labor and hopes for a better future, I rose to the position of President of Liberia," she asserted. On the issue of women political participation in Liberia and Africa, Madam Sirleaf noted; "the rising female political activism in recent years is a global phenomenon. Women are fighting to challenge the patriarchal political party structures designed to keep women as political outsiders." She furthered that the growing trend in female political participation across the globe is exciting but the challenges remain. The lingering vestiges of the structural barriers which historically precluded women from offices unfortunately still exist. It is now up to us, to continue to break the barriers, to push forward and illuminate the path for the generation coming behind us. It is up to us to create the world redefined, to create the Africa we want, the United States you want, and to create the world we want. Women, rise and shine, go for it, take it, claim it, it is yours."